ST. GEORGE — A Colorado river guide was reported missing Monday in the Grand Canyon. 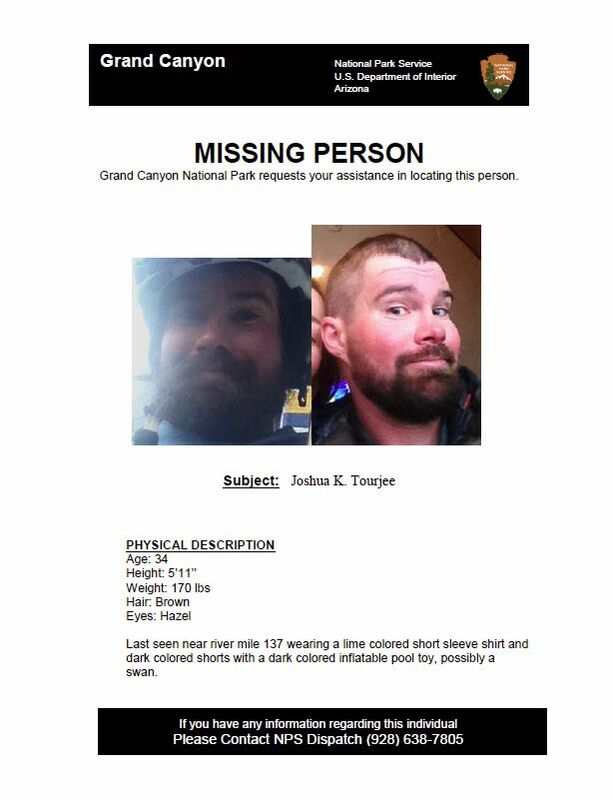 Joshua Tourjee of Moab, an employee of O.A.R.S in Angels Camp, California, was reported missing to the National Park Service after failing to return to camp Sunday evening. Due to high winds the National Park Service was unable to transport searchers into the canyon Monday. If weather conditions allow it, the searchers will be transported Tuesday, a press release said. Tourjee is described as a 34-year-old male, 5 feet 11 inches, 170 pounds, brown hair and hazel eyes. He was last seen wearing a lime colored short sleeve shirt and dark colored shorts. He was possibly carrying an inflatable pool raft in the shape of a black swan. Any individual with information on the whereabouts of Tourjee is asked to contact the National Park Service at (928) 638-7805.